This self-care kit gift basket shop has been compensated by Collective Bias, Inc. and its advertiser. All opinions are mine alone. #TimeWithAveeno #CollectiveBias As moms (and often women in general), it’s all too common to take care of everyone else first. Making time for self-care is SO important, yet it’s something we too often push off the to-do list. So today, I’m sharing some self-care products and showing you how to put together a simple self-care kit gift idea. It’s perfect for gifting to new moms, as a Mother’s Day gift, a “just because” gift for a friend, or to a friend going through a rough time. 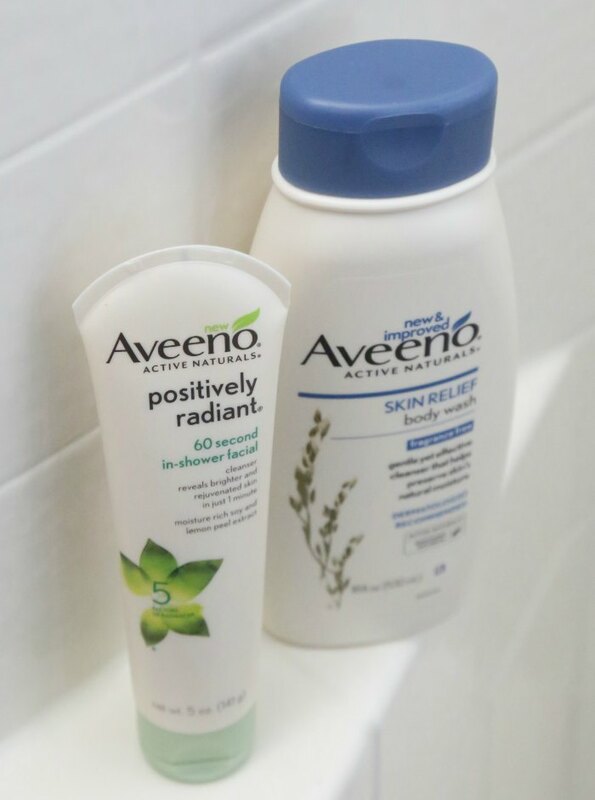 The star products in our basket are AVEENO® Skin Relief Body Wash and AVEENO® POSITIVELY RADIANT® 60 SECOND IN-SHOWER FACIAL. 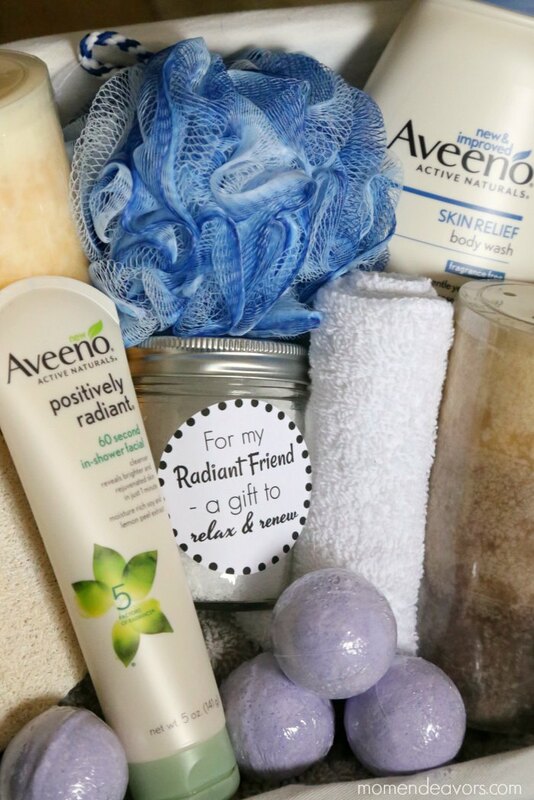 I love giving AVEENO® products as gifts – and using them myself. The AVEENO® Skin Relief Body Wash is creamy and leaves my skin feeling soothed and moisturized! It’s great to gift to others too as it’s hypoallergenic, gentle on sensitive skin, fragrance-free, and dye-free! Then, the AVEENO® POSITIVELY RADIANT® 60 SECOND IN-SHOWER FACIAL makes indulging in a moment of self-care easy! This new 60 Second In-Shower Facial transforms skin to be brighter and more naturally radiant in just one minute. It works with the steam of your shower to deeply but gently exfoliate dirt, oil and dead skin. I love having this on hand in the shower to help renew and refresh my face! So nice! 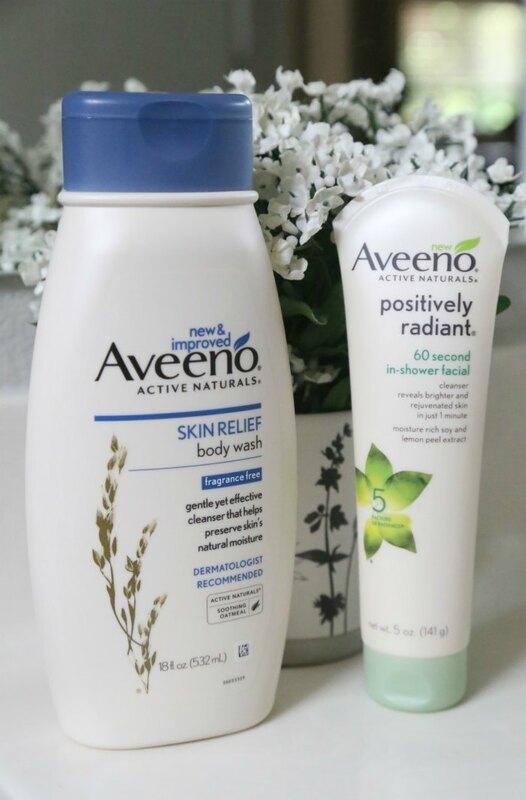 So, these AVEENO® products are perfect for starting your self-care kit with. Then, you’ll want to add items to fill the basket tailored to the particular person/occasion. 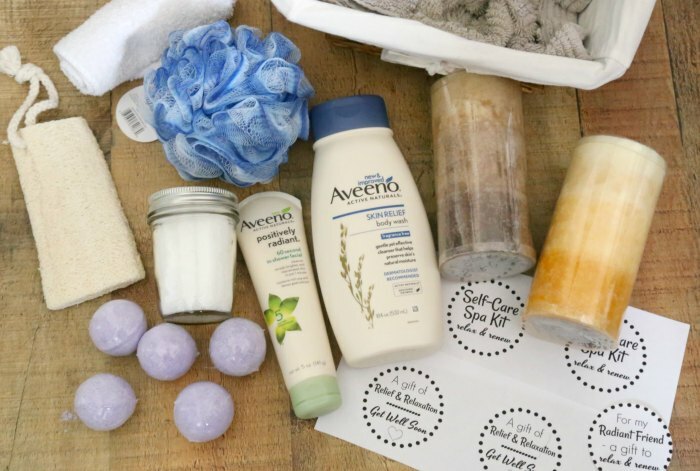 In addition to the AVEENO® products, possible ideas include candles, loofas, fluffy towel and/or washcloths, bath salts and/or bath bombs, fuzzy slippers, flowers, a journal or book, etc. 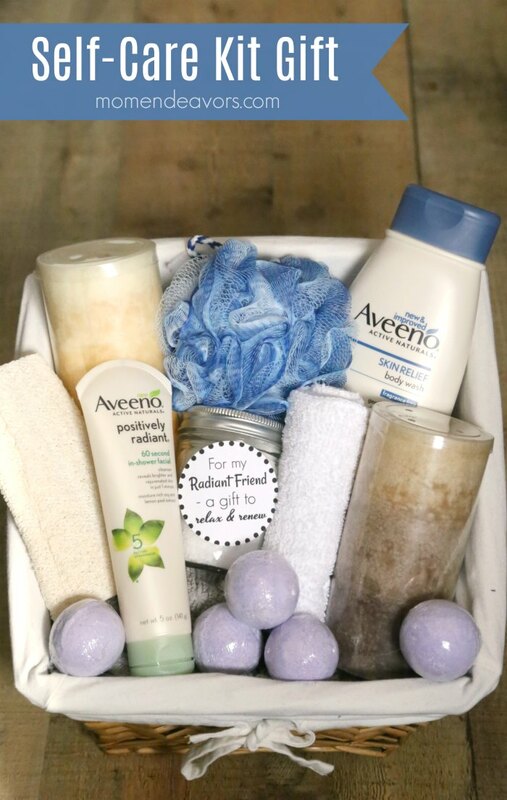 I went with a bath-themed gift basket for this self-care kit, using a towel as the filler and adding in the AVEENO® products, epsom salts, bath bombs, loofahs, and candles. Perfect for relaxing! Too add to the basket, I made some printable labels with sayings tied to the products as well! 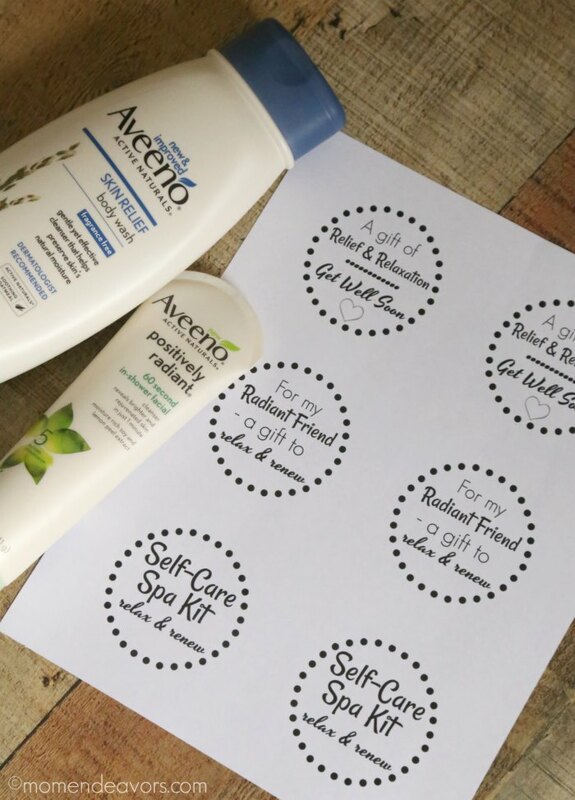 Print the tags and click here to download a coupon and save $2.00 on AVEENO® products! 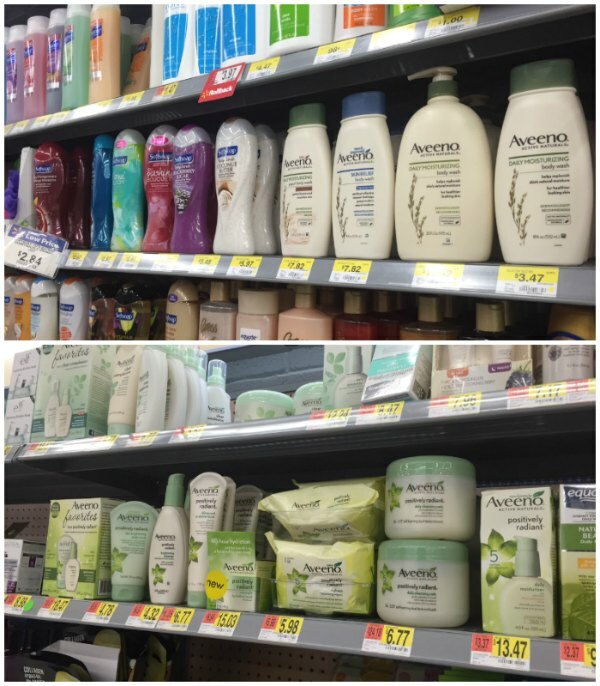 Then head to Walmart to buy your AVEENO® products and other items! You can treat yourself or a special women in your life! Who would you gift a self-care bath basket to? I have made a plan to present some bath products to my loving daughter in her upcoming birthday. But was in trouble to present them in a unique way. Your ideas have made it! Thanks Sara for your nice idea!